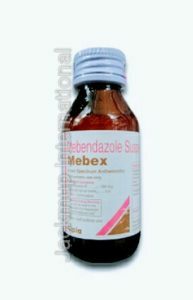 Description:- Mebex suspension is used in the treatment of parasitic worm infections. It belongs to a class of medicines called as anti-helmintics. It acts by inhibiting glucose uptake by larvae and adult helminthes; thereby killing them.